Winding and hauling engines were developed for use in mining operations and were fitted with one or two cable drums. To each drum was attached one end of a cable, the other end of the cable being fastened to the load. Winding referred to use of the engine for raising and lowering the attached cable(s) and load(s) in a vertical mine shaft. Hauling was the technical term used to describe use of the engine to haul a cable and its attached load up and down an incline, a regular practice in opencast mining during the late 19th century. 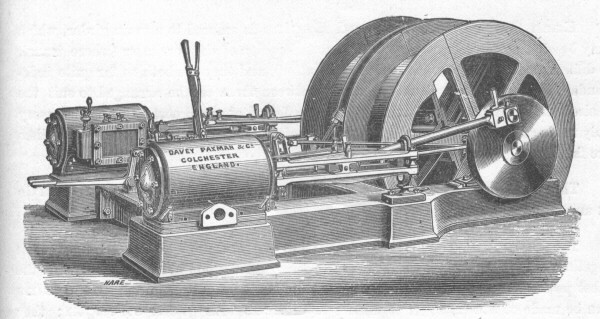 James Paxman introduced his first horizontal winding and hauling engine in 1878. Initially sales of this type of engine were mainly to import agents in South Africa to meet the needs of the diamond mining boom around Kimberley. The first sale was followed by a steady stream of orders, which reached a peak in 1880 and 1881, until the Kimberley 'bubble' burst during the second half of 1881. Although Paxman was a relatively small business compared with other British steam engine manufacturers, by 1881 it had supplied around 20% of the steam engines then in service in the Kimberley area. James Paxman himself visited Kimberley in the spring of 1881, vigorously promoting his company's products to the diamond mining industry. The value of the South African trade to Paxman did not rest solely on sales of winding and hauling engines. For virtually all these engines the Company secured the boiler orders. Also sold to the mining market were substantial numbers of other types of Paxman steam engine (particularly semi-portables) and boilers (including locomotive, Cornish and Lancashire types) and various items of mining machinery. In the late 1880s and during the 1890s new opportunities arose for Paxman to exploit the mining equipment market. Gold mining booms in the Witwatersrand and Johannesburg areas of South Africa and in Western Australia both provided good volumes of orders for steam engines and boilers. Reproduced below are the descriptions of Paxman's Direct Acting Winding and Hauling Engines, and Geared Winding Engines, as published in the Company's Catalogue No. 32 of June 1883 (pp 41-43). The geared version was designed for hauling heavier loads at a slower speed than the direct acting type. WITH SINGLE OR DOUBLE DRUMS ATTACHED. Sizes from 8 to 25 nominal Horse-Power inclusive. This Engine has been designed especially to suit the various kinds of Mining and other operations where winding and hauling are required, and it will supply a want long felt in small Winding Engines, as it disposes of all the complex gear and indirect mode of applying the power ; it greatly reduces the liability to breakage, is under better control, and is much more easily managed. Every care has been bestowed in order to produce an Engine that will give off the greatest amount of power with the least possible consumption of fuel and water. These are most important features where fuel and water are scarce. We make these engines also of the compound type, and when water is easily obtainable, we strongly recommend an Air Pump and Condenser, to reduce the cost of fuel to the lowest possible figure. In Ordering it is always advisable to have the Engine sufficiently large to do the duty required when cutting off at 25% of the stroke. Engraving of a Direct Acting Winding Engine in the June 1883 catalogue. It will be seen by the above engraving, that the connecting rods couple direct on to the discs of the main drum or winding shaft, these discs answering the purpose of fly-wheels. Each Steam Cylinder and Engine is secured to a main girder, which may be of cast or wrought Iron, at the option of the purchaser (where transit is difficult and costly we recommend the latter), and they are both so far quite independent of each other; thus the width between them can be arranged to suit the desired length of drum or drums. This is effected at small cost, it being necessary only to lengthen the two cross girders and main shaft to which the drums and discs are fixed. These Engines are made in various sizes, to lift from 10 Cwt. upwards at any required speed. The Stop Valve and Reversing Lever and Brake are arranged close together, and in a convenient position for being acted upon by the attendant in the most powerful manner, without moving from his post. If required, the drums can be made of steel, so as to ensure lightness with great strength ; they are provided with a very powerful brake. These Engines are made to work at high-pressure, and every care is bestowed upon both material and workmanship, which are of the very best kind. We make Steam Boilers specially strong and of various kinds to suit the above; and, in ordering, it is well to state the nature of the water, description of fuel used, convenience for fixing, and any other special features; also when enquiring for particulars, please state if the Engine is to be used for hauling or winding ; gross weight to be lifted; number of feet per minute at which the load is to travel, and (if for hauling) the incline. In each case say if single or double drums are required. Sizes 8 to 25 Nominal Horse-Power, inclusive. For Mining Purposes it is absolutely necessary to have a good and reliable Winding Engine for heavy loads. These Engines have, therefore, been specifically designed to haul heavier loads at a slower speed than the Direct Acting Engines just described. They are of excellent construction, special attention having been paid to ensure economical duty. They are built in a strong wrought-iron Frame, thus securing great strength and durability, combined with lightness. This is very important where transit is difficult and dear. The Connecting and Eccentric Rods are of the best forged Scrap Iron, and the Crank Shaft, Slide Rods, Crosshead, Joints and Pins are of Steel. The Reversing Link Motion is of the most approved construction, the Links and Pins being deeply case-hardened. All Bearings and Glands are of Gun Metal. The Winding Drums are of our improved design, mainly of Wrought Iron and Steel. They are fitted with a strong and efficient Brake. The Spur Ring and Pinion are of the best Cast-Steel. The Starting, Reversing, and Brake Levers are all brought together into a convenient position, within easy reach of the Engine-driver. These engines are made from 8 to 25 nominal horse-power inclusive. A very large number of these Engines are now at work in all parts of the world, giving the greatest satisfaction. When enquiring for particulars, please state if Engine is to be used for hauling or winding, gross weight to be lifted ; number of feet per minute at which the load is to travel, and (if for hauling) the incline. In each case say if single or double drums are required. 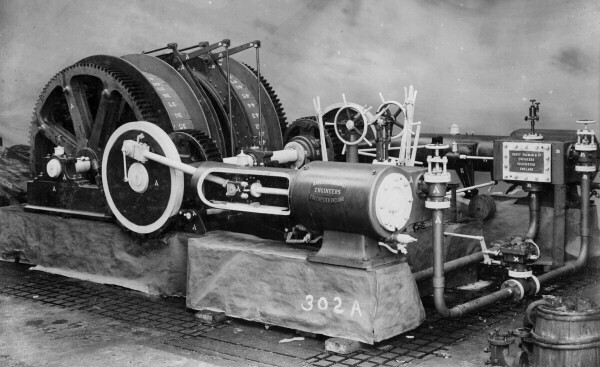 A Paxman double drum geared winding engine. This photograph probably dates from the last decade of the 19th century.